No matter if you are a kid or a grown-up adult; the basics are the same. If you have read those words I’m sure I don’t have to tell you why to cycle because you are already aware that it’s one of the best things in life! It’s never too late to start cycling. Safe place must be away from traffic. You don’t need anything which attracts you while making your first steps. Also, you don’t want to put yourself in danger. A safe place for starting is some park or any small traffic-free road. I suggest you to start riding in short grass. It’s a little-bit harder to start but if you fall, it doesn’t hurt. The narrow road is also a good point, because chances are that in that case you will probably fall on grass. Keep in mind that you may fall and you don’t want to ruin your clothes. You can use knee and elbow protections here, which decreases possible injury risk. Don’t wear baggy shorts because if you fall, they might get stuck in the saddle. Try to put on closed-toe shoes, for example joggers. You should not wear very wide-legged or loose trousers as they can also stick to your front derailleur. If you have no other options, always make sure to tuck them inside socks! Yes, that’s me with the helmet! Let’s make it simple – that’s rule number one! Let’s make it simple – that’s rule number one! Especially when you are on learning stages of how to ride a bike. You must always wear a helmet and you should make sure that your kid wears a helmet when especially during their learning time span. The helmet is crucial because your head is your fortune! You can do anything with your head, but without a working head you can do nothing! Keep your head safe as I know people who didn’t wear a helmet and they are not able to walk anymore due to mishaps. The helmet is much stronger than your head (which is as strong as a watermelon!). If you crash your helmet, you should buy a new helmet because you don’t understand the importance of staying safe. NOTE: By not wearing a helmet, you set a bad example for other riders to follow as well. Make sure that you have the right saddle height. You can lean against the wall. If your foot is in the lower position, there should be a nice bend behind your knee. 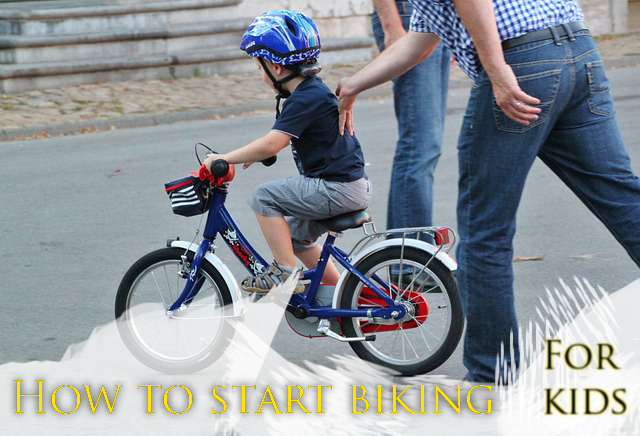 If you learn how to ride a bike, then you can start with the lower saddle at first and raise it when you feel yourself more comfortable. 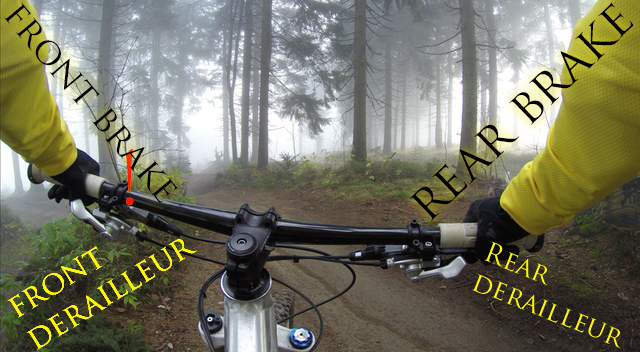 Make sure you reach to handlebar easily and can brake, turn and change gears. There are two ways for adults and one for children. 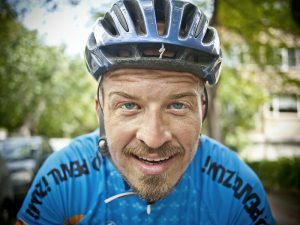 Now I’ll teach you how I learnt cycling – fast! If they have gears, put on the small gear. You should hold behind the saddle and let them pedal after you’re pushing a small velocity. Let them feel the balance. And let them stop and put one foot down. If they do get the feeling, let them start making circles (not too small). If they get the catch, you can let loose the saddle for a few seconds and see, how they’re doing. If they’re doing well, let your hands from saddle away from 5 seconds, then 10 seconds (always walking/running on behind!) And then let them loose and let them make circles, brake. If they start changing the have gears, you might help them behind the saddle again. Let them use the rear derailleur because there are the speed changing smaller. Just start below from point 1 to point 4. The first method is that you lean against the wall, feet on the pedals, one hand on the handlebar. Start pedaling and push yourself away from the wall. Make small circles and then 8’s. Feel the brakes (RIGHT – REAR first!). Change gears, from behind and then first. NOTE: Keep in mind not to push hard on pedals when changing gears. It can ruin the derailleurs and set you off the balance. The second method is to put one pedal up and your foot on it. Then push it down and sit in the saddle, the leg, which was touching the ground to pedal and start pedaling. All the same parts afterwards are the ones mentioned in the previous method. 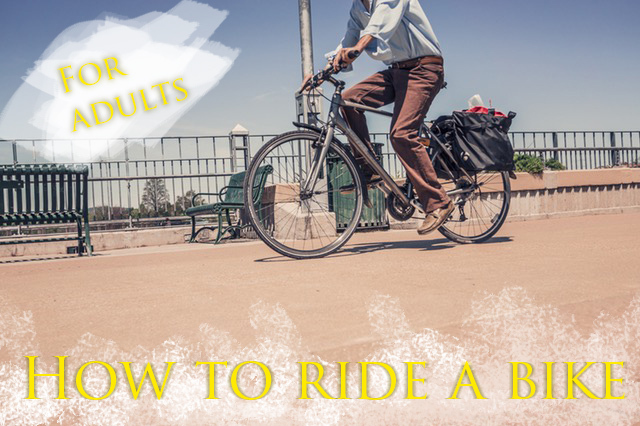 Both are quite easy ways to those who want to learn how to ride a bike. Related: Find proper bikes for yourself here. From low to high. Change the gear from lever. I suggest not to change over 2 gears once. 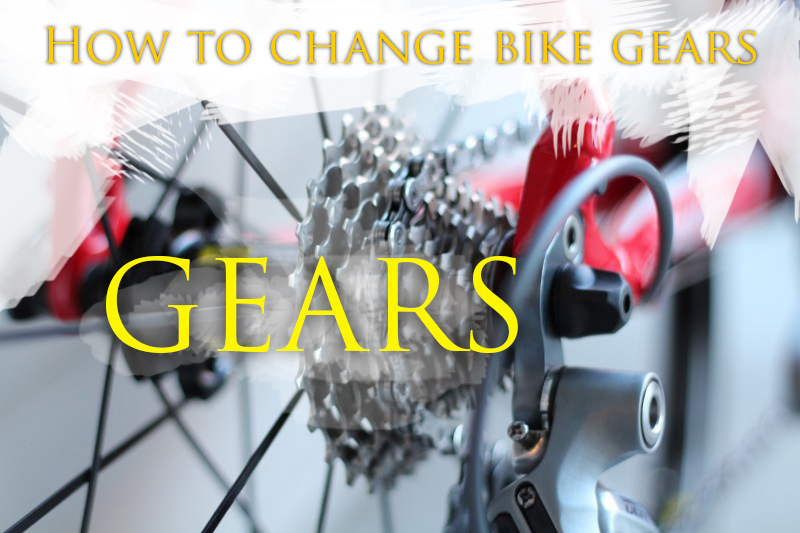 Then pedal smoother and let Derailleurs change gears. You feel little cranks. If it ends, you can pedal as always. NOTE: Don’t press hard when changing gears! If you get the feeling, try to find the proper gear before the slope. You want to be on a faster gear to get up the hill much quicker. What to do, when you see that you can’t go over the steep hill? Let me explain on the next chapter. How to brake with rear brake? Use only rear brake at the beginning! I will teach you the proper use of the front brake also. Just try to get the right feeling how the brakes work. Ride 10-15 mph and look for one object (a line or a sinkhole), and try to stop there with mediate braking. If you stopped too soon or late, try again. It should be easy. NOTE: The maximum braking performance is at this point where the tire rolls and doesn’t skid. Try to brake on different terrains – tarmac, wet asphalt, mud etc. Look how bike acts differently. Braking is a very important when getting to know, how to ride a bike. That’s one of the scariest things for too many bikers. Actually, there’s nothing to be afraid of. Let me explain. When you ride a bicycle, your balance is somewhere quite center and high. 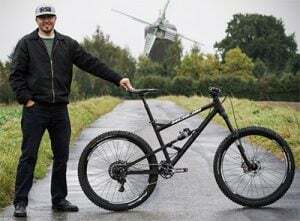 Here comes the physics – if you brake with your front brake, then your bike stops, but your body (which is heavier than the bike) wants to move forward. Because you didn’t brake your body but the bicycle! To avoid that, you might want to give a smooth braking with your front brake. But, you must use your front brake! It’s crucial in many situations. You can use your rear brake in most cases, but for shorter distances, you want to use your front brake too. Make an exercise. Use only the front brake when riding slowly. Use it smoothly. If you get the feeling, then try to turn. You see that it acts differently. When riding in a very steep hill, you must use only your front brake! Why? Because, otherwise you might fall backwards. Always use the front brake with caution! Actually, you should use both brakes all the time. Rear one is the main brake and the front one is that makes the distance shorter. When turning on slippery roads, you might want to let go of the front brake because it can make you fall. Practice, practice and practice. That’s the only thing which makes you better. Cycling is something you never forget. 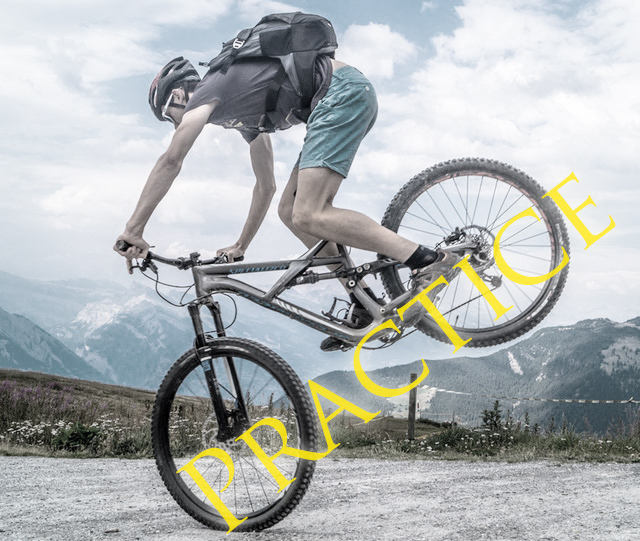 The more you practice, the more you know about how to ride a bike and the more confident you are. And remember, even if you can ride a bike – ALWAYS wear a helmet! I hope you now know how to teach a kid to ride a bike!